The ODMP was founded in a college dorm room in 1996. 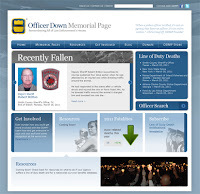 Since then, it has become one of the Top 3 most visited law enforcement websites in the world. We are extremely honored to announce the first major redesign of the memorial since 2003. This redesign has been in the making for almost a year, and was only made possible through the extremely generous support of the United States Department of Justice, Law Enforcement United, and every donor and daily visitor. It is a privilege of everyone involved with the ODMP to be able to honor and remember our fallen heroes. In the coming months we'll be adding additional new features to the ODMP that will better enable everyone to honor our fallen heroes, training officers to better train their students, and survivors to access the benefits they need. Without further ado, we invite you to visit the newly designed ODMP right now.